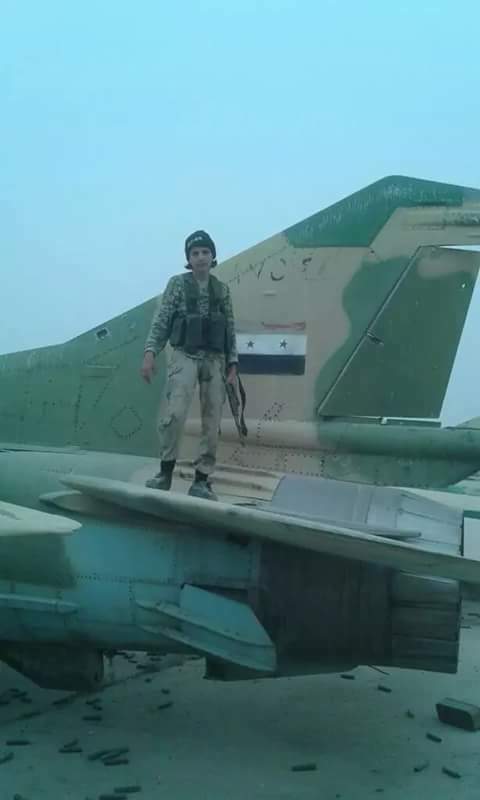 Yesterday, 17th Sep. 2015, a SyAAF Su-22M-4 operating from T4 airbase and piloted by Col. Muhammad Al-Hussein "العقيد محمد الحسين" was shot down over Jazal oil field area located around 40km to the north east of the said airbase. 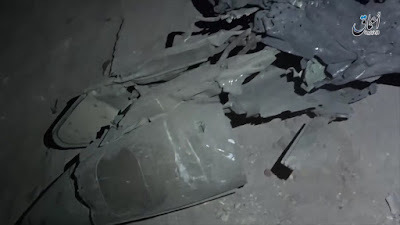 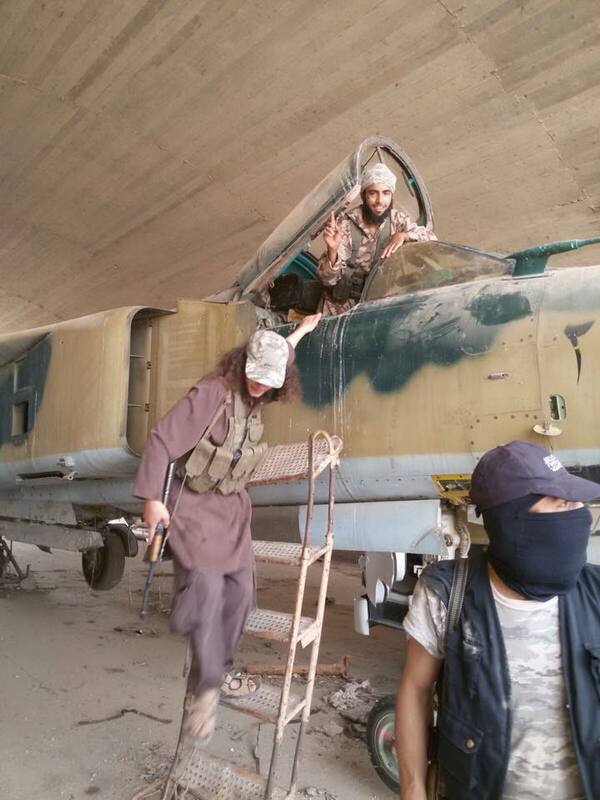 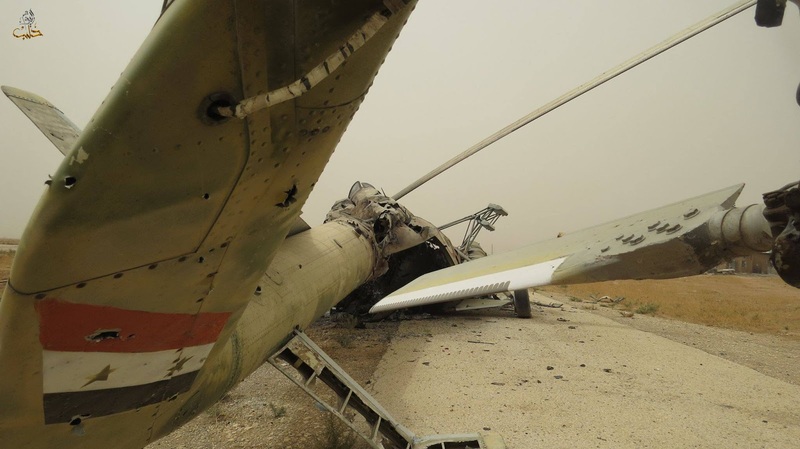 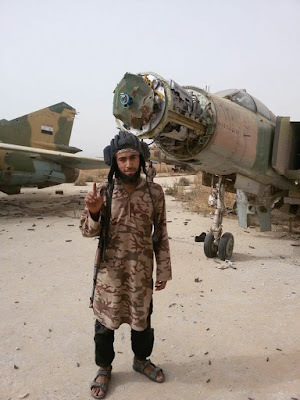 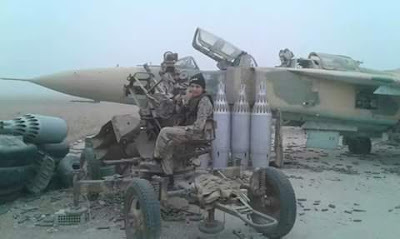 ISIS media reported shooting down the aircraft claimed as 'MiG-21' which is apparently not. 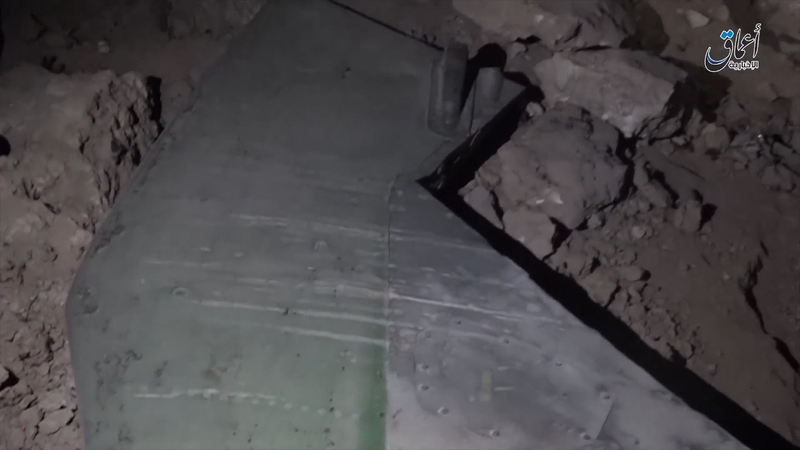 This VIDEO below shows the remnants of the Su-22M-4 such as the tail fin and the drag-chute compartment. At last, I found them, since this photo -above- came to public more than two years ago, I knew I will find them here in Abu DhHur! 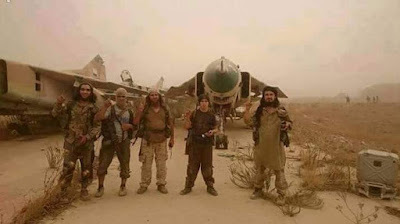 Yes, they are the lost Floggers Muammar Al-Gaddafi donated to SyAAF during the 1982 war with Israel. 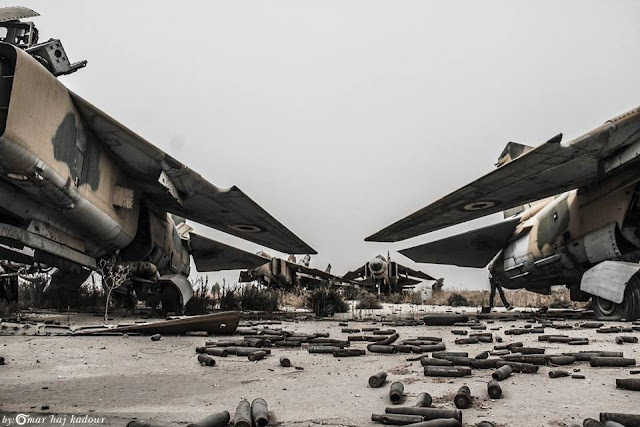 The story I heard from my beloved man some 25 years back, the words in my mind just sound as I was told yesterday: shortly and few days after the war started between Syria and Israel in and over Lebanon in 1982, Syrian Arab Air Force suffered unbelievable losses of aircraft in air combats against much advanced air force equipped that time with the latest electronic warfare technologies resulted in the loss of around 70 aircraft between MiG-21MF/bis, MiG-23MS/MF/BN and Su-22M's in a matter of five days! 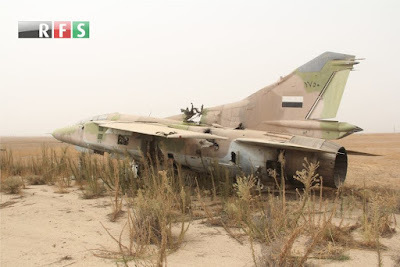 Col. Muammar Al-Gaddafi the president of Libya and the friend of Hafez Al-Assad that time, promised to compensate any loss SyAAF suffers at this war, he truly fulfilled his commitment and started to deliver MiG's to Syria but...after the third day, he gave up when the losses reached around 20 aircraft with a big chance the number will increase the coming days. 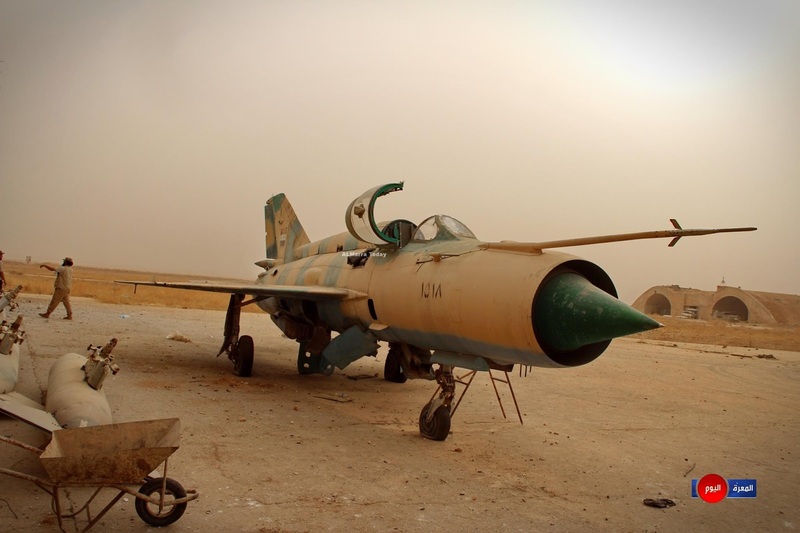 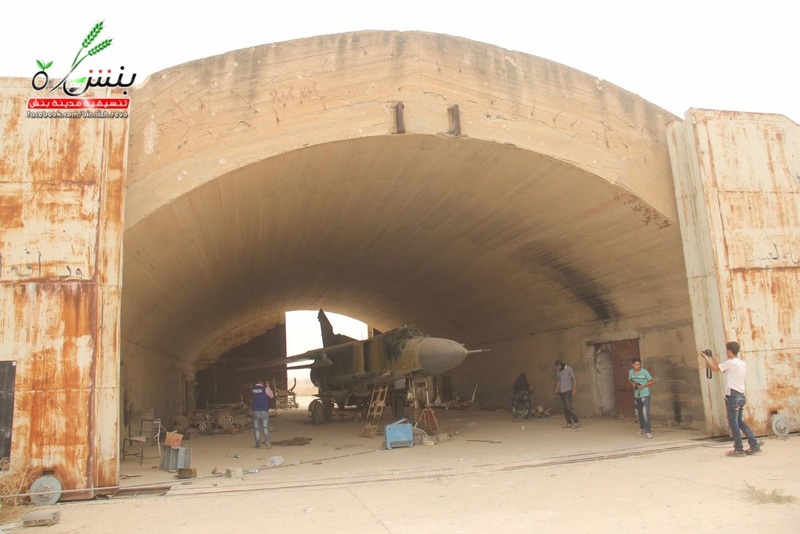 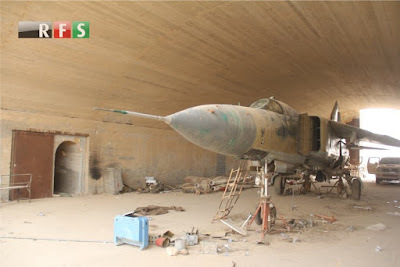 The MiG's he has donated were MiG-23MS's, around 10 airframes used later on and for years by SyAAF until this variant was withdrawn from service and put in storage in early 2000's and then was completely decommissioned/scrapped on 2011. 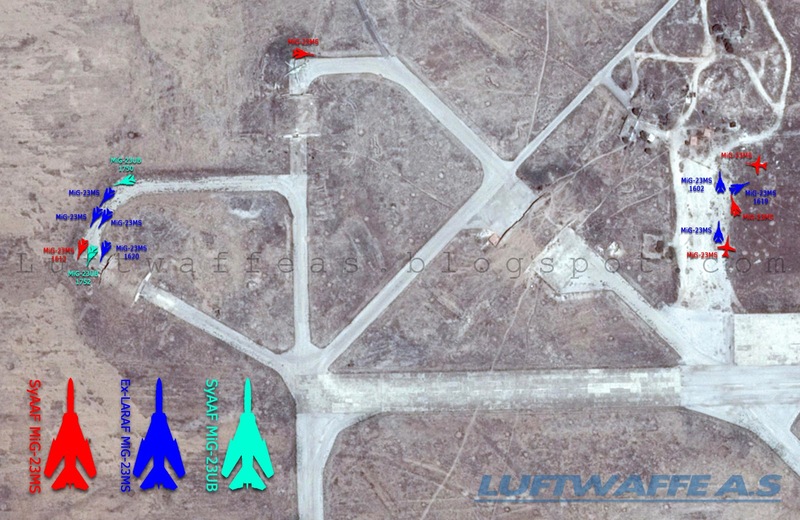 The key-map below -which is self explanatory- explains the location of MiG-23MS's in the bone yards in the north western side of Abu DhHur airbase. 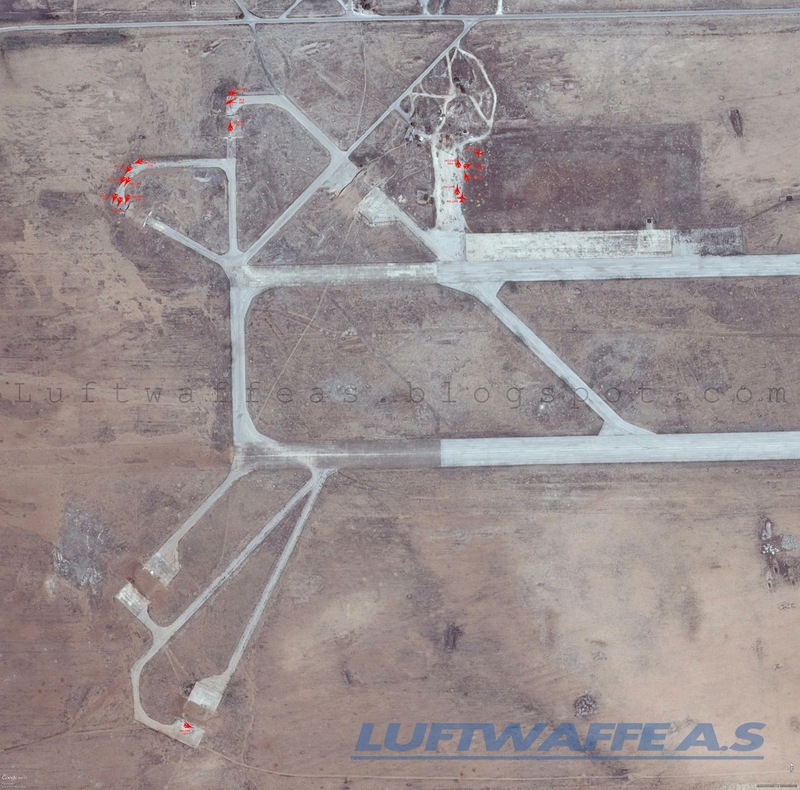 Referring to footage of photos and videos released for the airfield after it was overrun by Jaish Al-Fateh on 9th Sep. 2015, I could count '7' Ex-LARAF Floggers shown in dark blue. A bird's eye shot for the western group of phased-out MiG's for better understanding and linking to the key-map above. 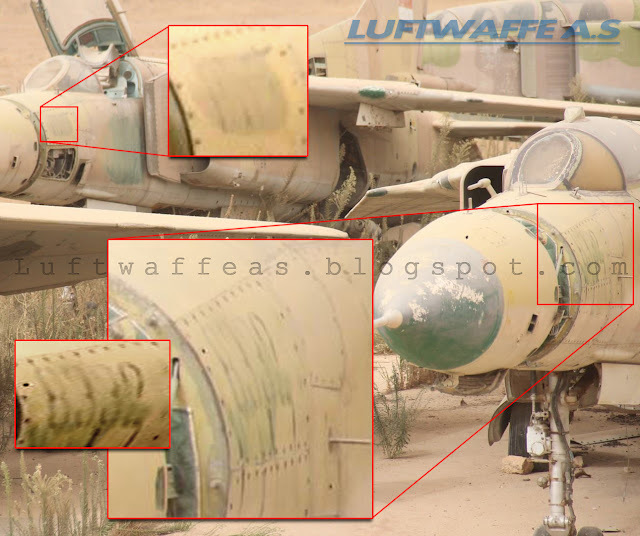 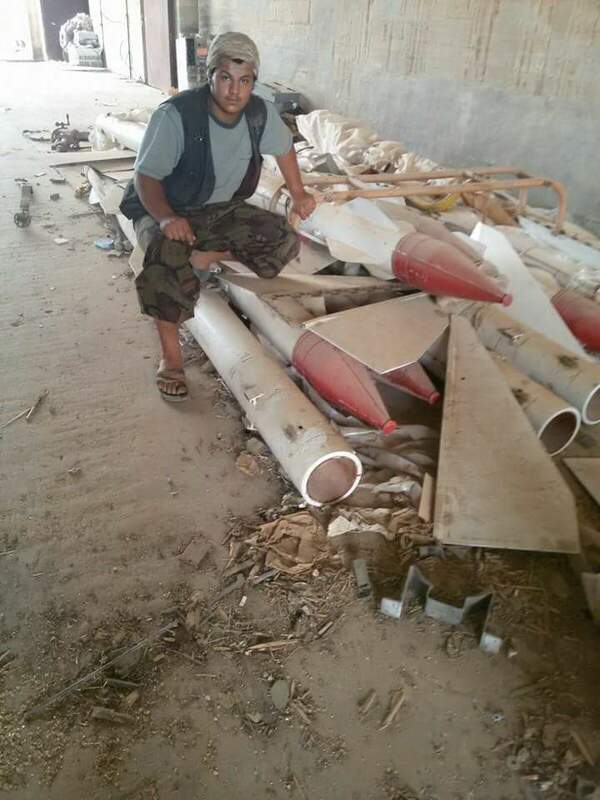 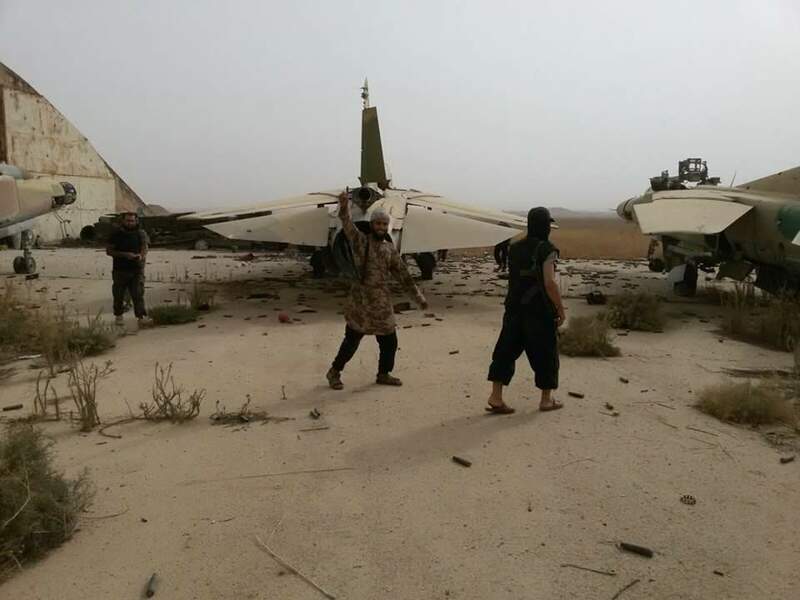 The Ex-LARAF Floggers can be easily distinguished by their light original camo pattern appeared after the new one -applied in the 'Factory' in Al-Neyrab AB during regular overhauls to these fighters- been washed out by weather. 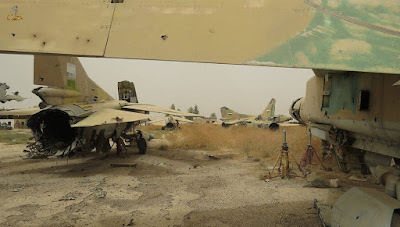 The photo above taken at the western boneyard shows the Ex-LARAF MiG-23MS with its original '8332' serial number clearly readable after the new camo is washed out. 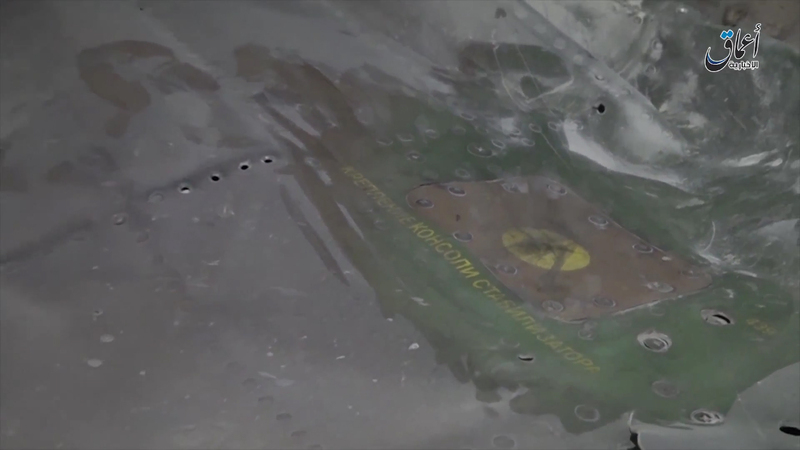 Also you can notice the Flogger at the background where it has its original serial number still hidden under the very 'casual' hand paint stroke. In the eastern boneyard, I could find one Ex-LARAF MiG-23MS with visible original serial reads: '1835'. For better understanding and comparison, I prepared the above image showing an operational LARAF MiG-23MS at the top explaining the location of serials and flash on the fin tail. 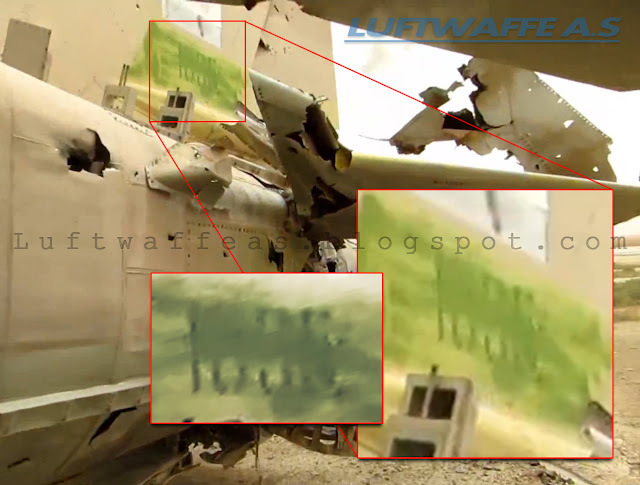 The examples seen in Abu DhHur AB had the Syrian flag painted exactly over the Libyan one on the fin tail (and of course similarly the roundels on wings), got the serial on fin tail totally hidden -as SyAAF used to print the serial over flash on fin tail not under- and finally the SyAAF serial number 16xx was written over the LARAF one in the front fuselage. 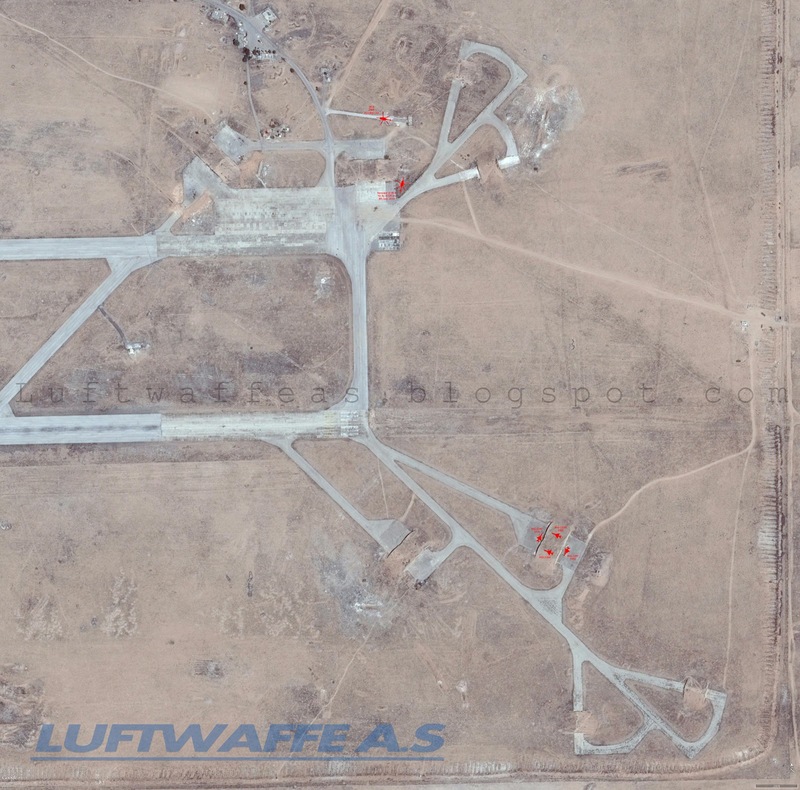 On 9th Sep. 2015, Jaish Al-Fateh "جيش الفتح" led by Jabhat Al-Nusra "جبهة النصرة" overran Abu DhHour airbase and took control of the whole airfield. 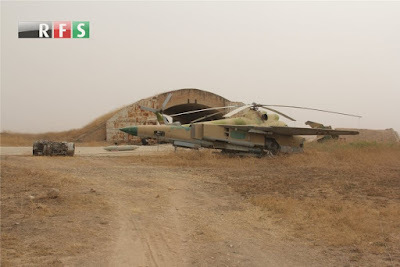 I'm not going to talk here about the operation in details as this was the fruit of more than two years of besieging the airbase with uncountable trials to penetrate the defensive lines to take over this base which a lot of towns around suffered from. 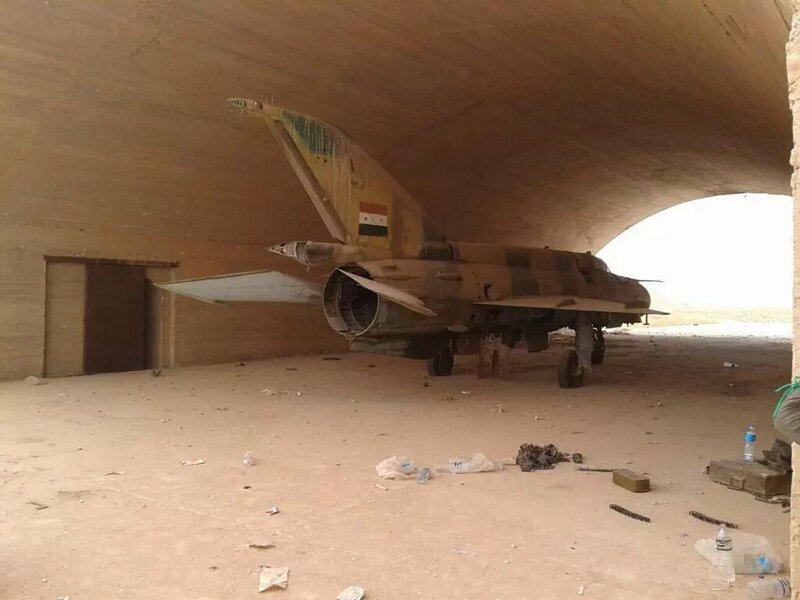 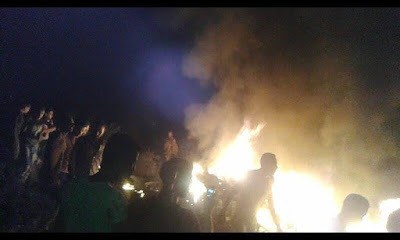 It's just important to mention the sand storm which rebels prefer to call "Gift from Heaven" which provided a cover from the SyAAF aircraft used to bombard the advanced rebels upon calls from the airbase itself. 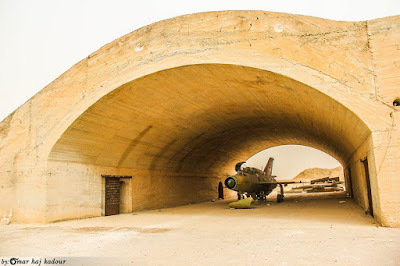 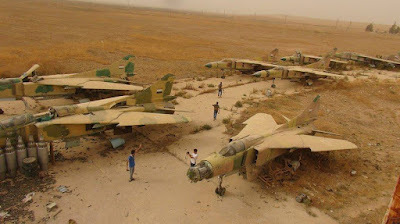 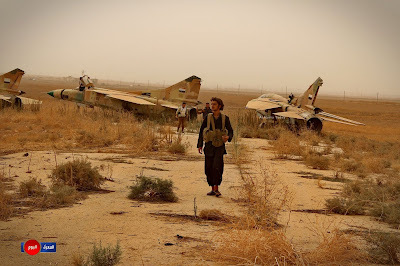 The aircraft left in the airfield are just scraps and useless, most of them are the first generation of MiG-23MS which were delivered to SyAAF on 1974 just after the 73 war. The other MiG-21s are non airworthy anymore as the regime -and especially after downing two MiG-21bis sometime in 2012- worked to flee whatever operational out to Hama AFB. R-60 and R-23/24 missiles are thrown beside this Flogger, they are not bombs finally and 'useless' for SyAAF in this civil war! Today, 9th Sep. 2015, a bunch of great photos came to public from Abu DhHour air force base after units from Jabhat Al-Nusra succeeded to penetrate the defenders and hold the gate and the western side of the airfield. 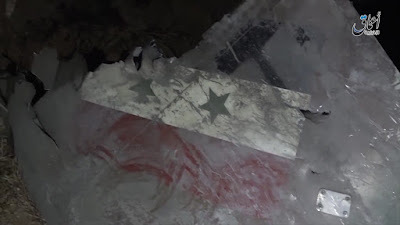 We will expect more in the coming hours. 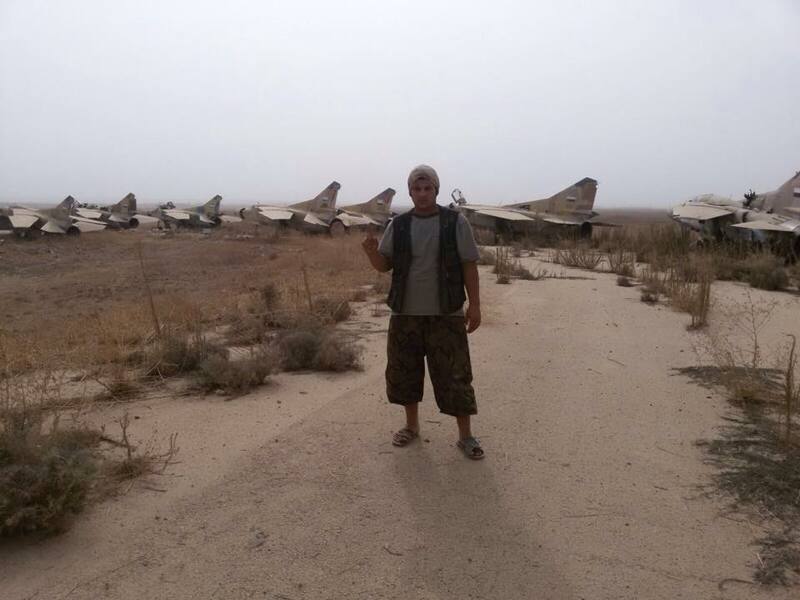 Above is units pose in front of phased out SyAAF MiG-23s (MS and UB). 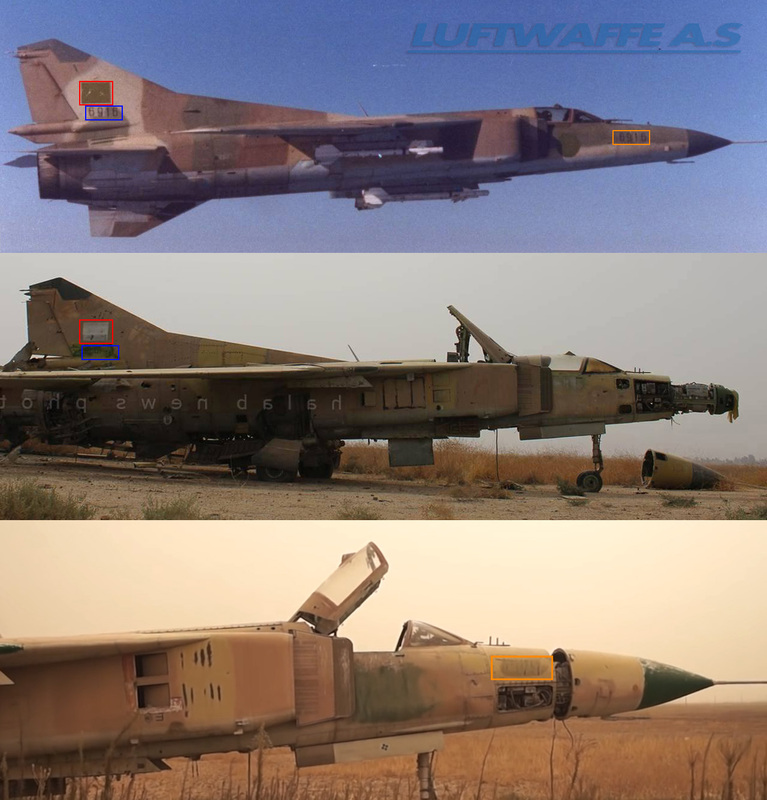 Tail fin of a SyAAF MiG-23UB carries the serial 1754. Could be the same UB here. 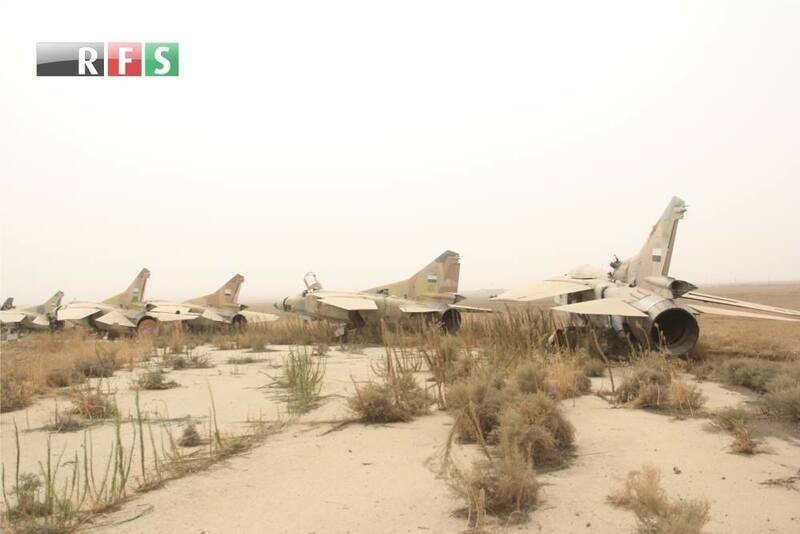 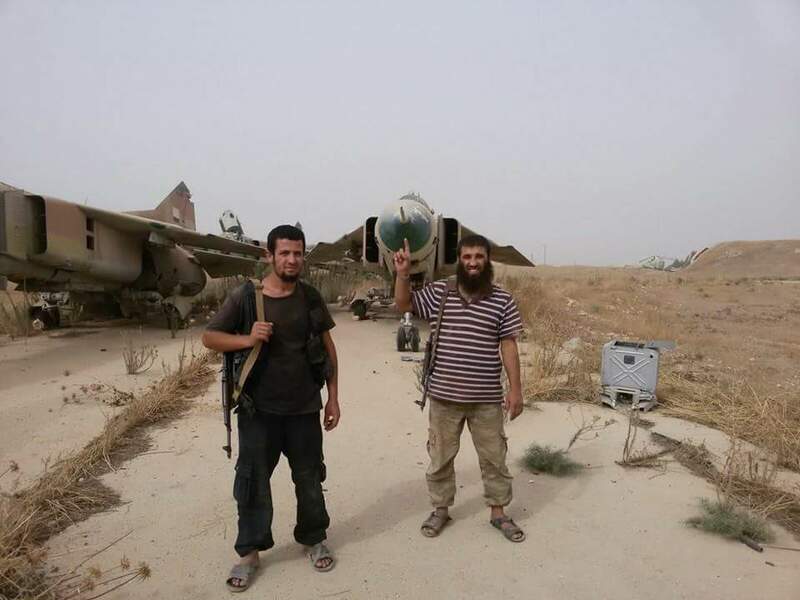 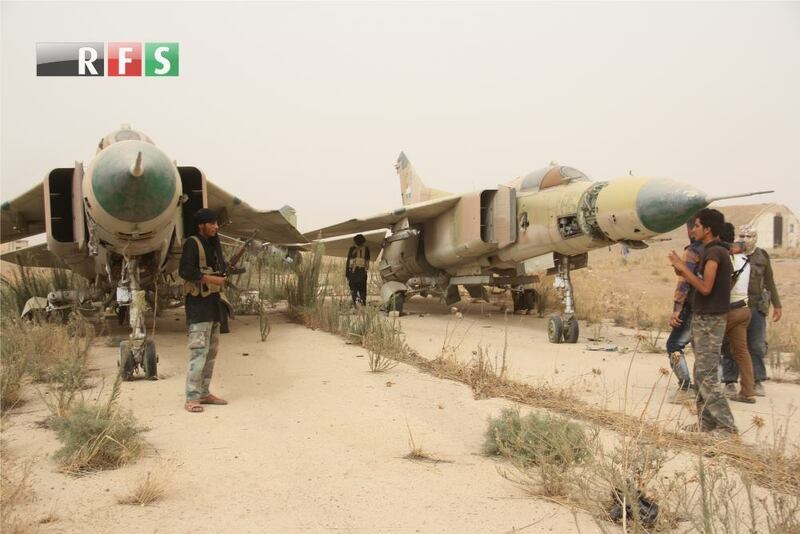 Bone yard of SyAAF MiG-23MS/MF/UB near the north eastern HAS's. SyAAF MiG-23MF -sadly the serial is incomplete- decommissioned inside a HAS. 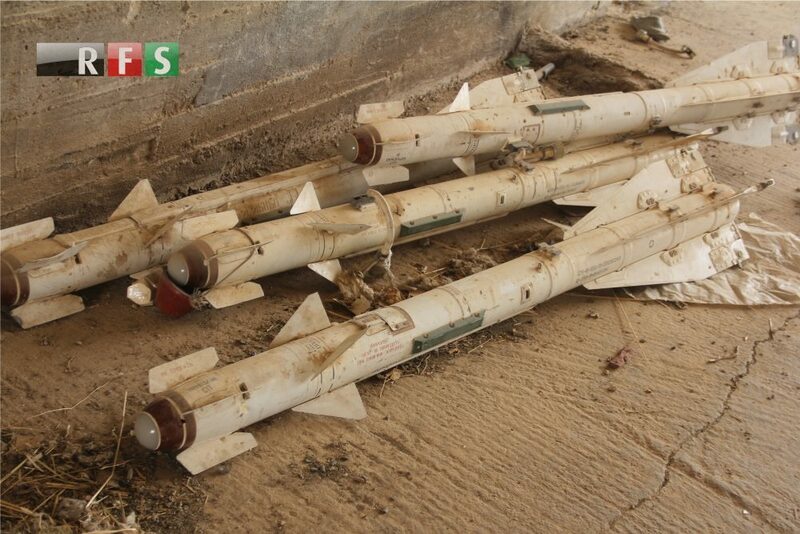 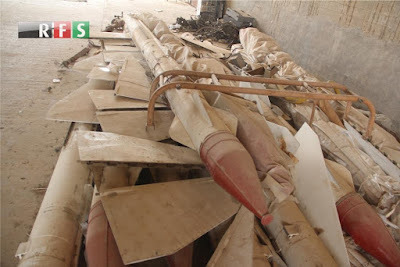 Remnants of R-23/24 air-to-air missiles. Hope someone there is -as interested in serials as me- would make a photo tour recording all serials of those Syrian Floggers. 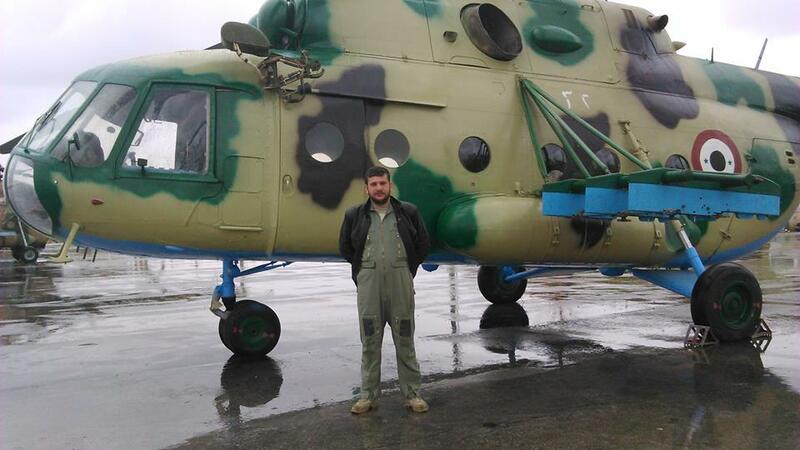 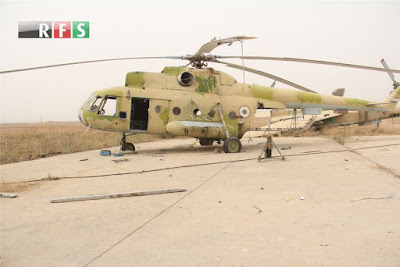 What I'm still looking for is some photos for the MiG-21's at the furthest south eastern HAS's in the airfield in addition to clearer photo for the damaged 2904 Mi-17 there.